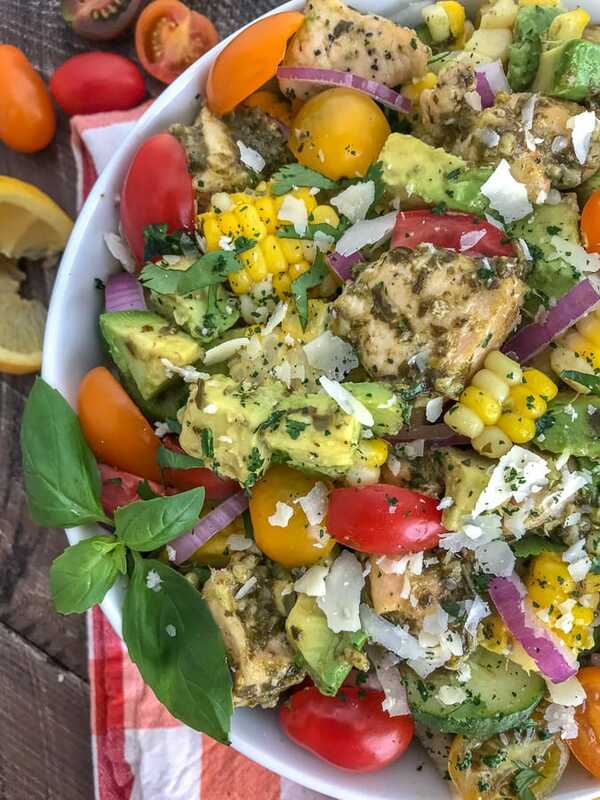 This healthy, super simple to make, and delicious Lemon Pesto Chicken Avocado Salad recipe is loaded with avocado, cherry tomatoes, sliced cucumber, red onions, corn, and the most delicious lemon pesto chicken. 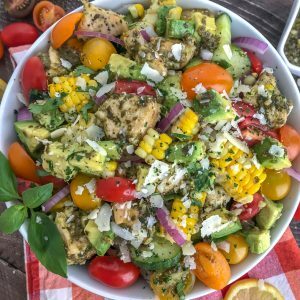 This Lemon Pesto Chicken Avocado Salad is about to become your go-to for summer salads! Not only will you love how easy it is to make, but your taste buds are going to absolutely adore how scrumptious it is! They are – aren’t they? In my honest opinion, summer should be spent basking in the warm sunshine, surrounded by the people you love and adore, sharing the best grilled and fresh foods! 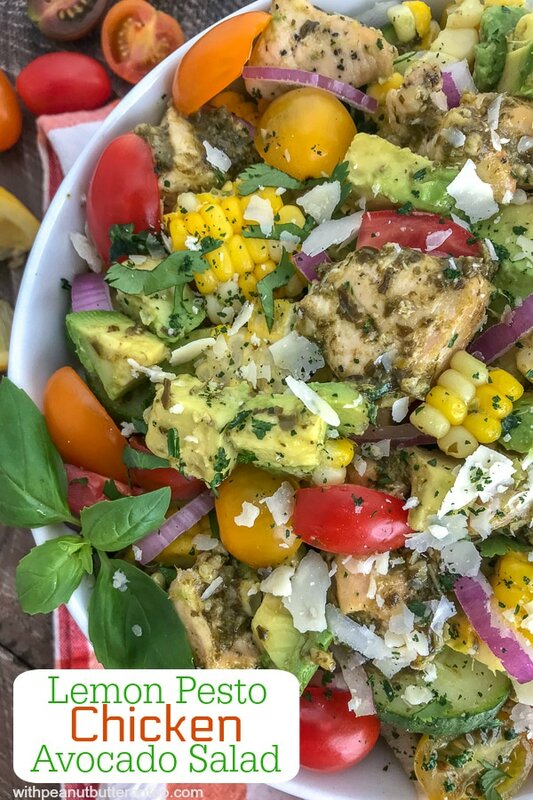 Hence the creation of this Lemon Pesto Chicken Avocado Salad. This salad is very simple to make, can be put together in no time, and is perfect for any occasion. Sure to be a family and crowd pleaser! It also helps that, at the time of this recipe creation, I was in need of finishing off a jar of pesto sauce that I have been eyeing in my fridge for days. Pesto is one of those sauces that you can combine with just about anything; sandwiches, wraps, tossed with fresh pasta, or in a cold salad like this! This salad has so many flavors in it – it’s a wonder I was able to get it to the table to take a few photos! 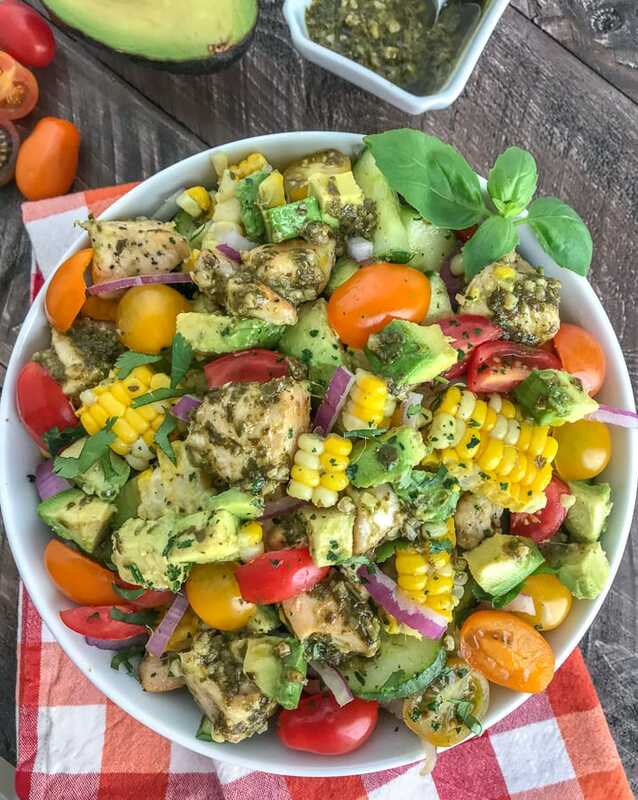 The chicken is tossed in a lemon basil pesto dressing, then combined with the remaining vegetables to be tossed together with a fresh squeeze of lemon juice and extra lemon basil pesto dressing. It’s garnished with additional basil and freshly shaved parmesan cheese. YUM! SO DELICIOUS. Trust me – you are going to delight not just yourself, but those you share this recipe with. It’s easy, it’s flavorful, and it’s filling. Very easy to make with a handful of ingredients. Takes no time at all – perfect for those last minute, throw-together meals. Uses only fresh ingredients and it jam-packed full of veggies. It is the perfect, refreshing summer salad. Guaranteed to be a crowd pleaser. Move over boring salads! 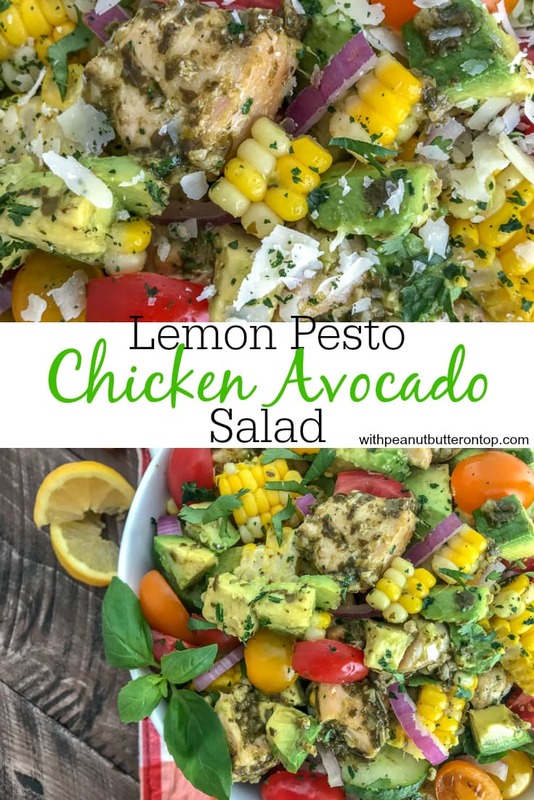 This Lemon Pesto Chicken Avocado Salad is going to be your new favorite all-in-one meal or side dish! Summer is difficult enough to get through with all of the grilled burgers, hot dogs, pasta salads, s’mores, and I could go on. OH MY! 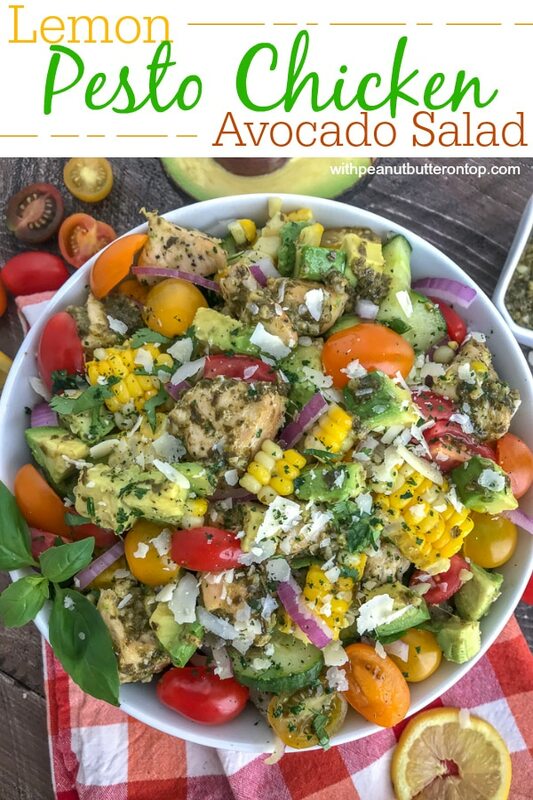 (Now I want a burnt hot dog from the grill…) So light, refreshing and healthy salads like this are the perfect go-to when you need to pull in the reigns on the indulging meals! Plus – you will feel like you’re indulging with this salad! Let’s do away with those depriving meals, ok?? Life is much too short to not eat delicious foods! You can swap cooking chicken for rotisserie chicken to cut back on time and cooking. To amp up this salad and make it even more summertime flavorful – grill the chicken! If you cook the chicken and boil the corn: make sure both are cooled prior to tossing into the salad. You can swap corn on the cob for frozen corn (thawed). Add the avocado and parmesan cheese when you’re ready to serve. The avocado turns quickly once cut. This salad is best when served fresh. Some more healthy, delicious salads for you! 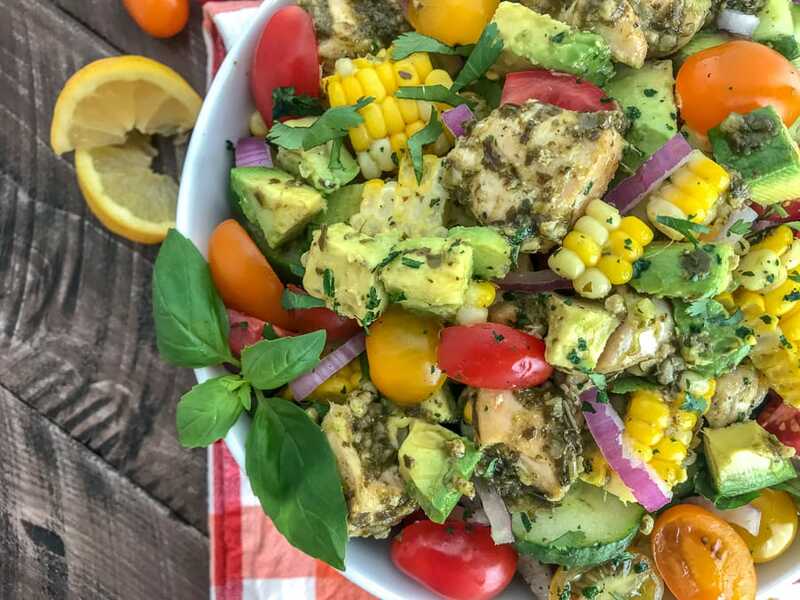 A light, refreshing and healthy salad that is perfect for when you're on-the-go or looking to please a crowd at your next BBQ. The best summer salad! Place a large nonstick pan or skillet over medium heat with 1 tablespoon of olive oil. Slice the chicken breast into small chunks. Toss with the salt, pepper, and garlic powder. Once the pan has heated, add the chicken and allow to cook 6-8 minutes or until cooked through. Stirring frequently. Chicken should reach an internal temperature of 165 degrees F.
Remove from pan to a plate and allow to cool. 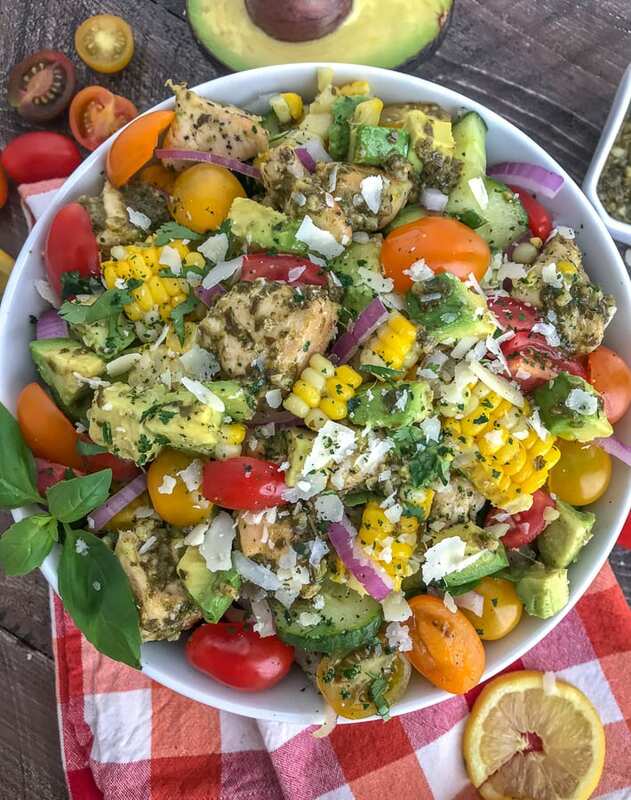 While the chicken is cooking, prepare the remaining salad ingredients (minus the avocado) and combine into one large bowl. Combine the ingredients for the Lemon Pesto Dressing in a small mixing bowl. Toss half of the dressing with the chicken once it has cooled. Add the chicken to the salad and toss to thoroughly combine. Drizzle the remaining dressing overtop of the salad, add the avocado, and garnish with basil, additional parmesan cheese, and (if desired) extra lemon juice. You can swap cooking chicken for rotisserie chicken to cut back on time and cooking. 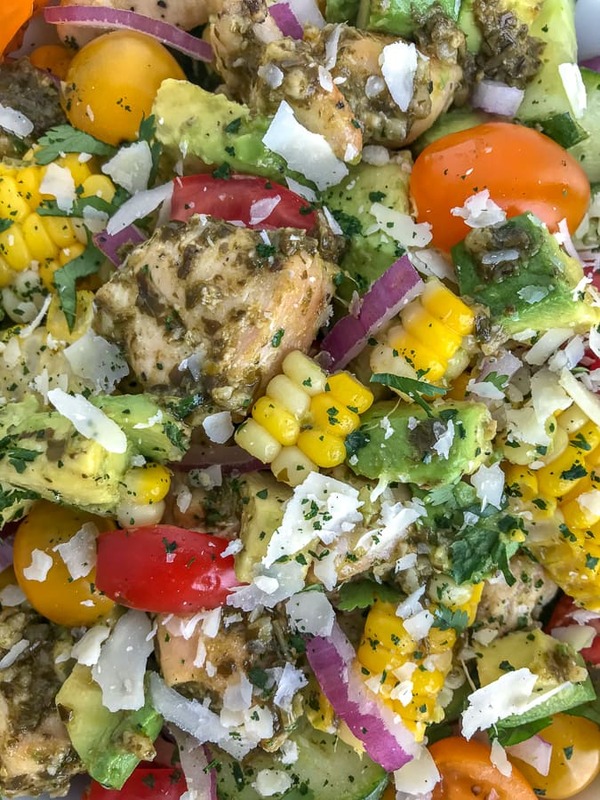 To amp up this salad and make it even more summertime flavorful - grill the chicken! Add the avocado and parmesan cheese when you're ready to serve. The avocado turns quickly once cut. This salad is best when served fresh. i made this for my family a few weekends ago. The flavor was amazing, and everyone enjoyed it. Hey Bonnie! Thank you for your feedback. I’m glad you all enjoyed it!